Since Hurricane Irene knocked out my power, I spent a lot of time reading by candlelight last weekend. It seemed only appropriate to read a book about an era in which they had no choice but to use candlelight. “The Courtiers: Splendor and Intrigue in the Georgian Court at Kensington Palace” by Lucy Worsley was an amusing as well as educational way to while away the hours without TV or Internet. Its topic is the era during which the Kings George (primarily Georges I and II) ruled England and, more particularly, the minutiae of life in the royal court at Kensington. Rather than focusing on the lives of the rulers themselves, Worsley endeavors to unearth the lives of the courtiers who tended to, amused, and worked for the kings and their families. 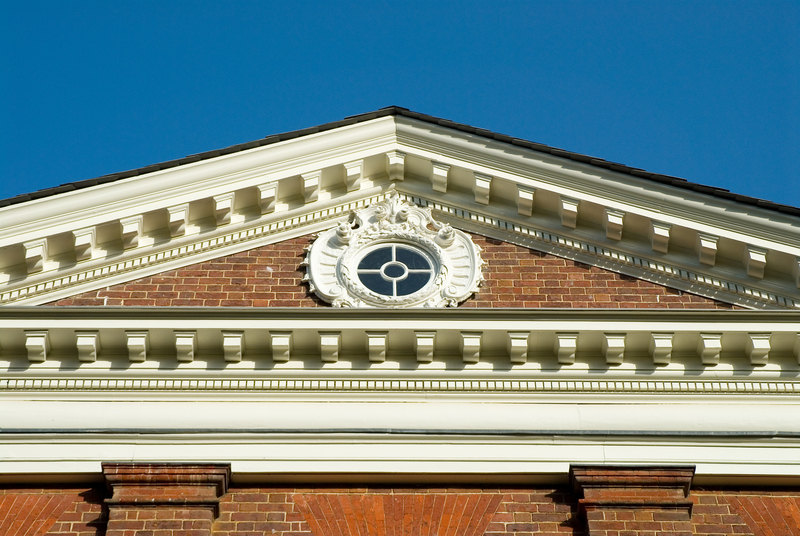 While the early Georgian era discussed in the book predates the Hammond-Harwood House, it helped to illuminate for me exactly what our colonial forefathers and mothers were rebelling against when they threw off English rule. The detailed descriptions of the hierarchical structure of court life, the overwhelming attention to manners and appearances, and the ways in which people were used as amusements for bored rulers made it clear that the American colonists had manifold reasons for desiring a more equitable and democratic society. As well as Lucy Worsley’s book, I also recommend checking out her website. Worsley has the great luck to be the Chief Curator at Historic Royal Palaces and so has amazing access to fun places in England, and writes articles and makes videos about royalty and the court in the Georgian and Regency eras. She seems to have a sense of humor, which is one of my favorite qualities to find in a historian. Our photographs from the Historic American Buildings Survey (HABS) came! They were taken by photographer James Rosenthal, and I think that the interior shots in particular provide a different view of the Hammond-Harwood House. I am astonished at how big a change temporarily removing the stanchions made. To me, the pictures reinforce the fact that this was a house (with a small h) for years and years before it became a House (with a big H). By that I mean that this was a home, where people ate, slept, read books, took care of their families, and did all of the little activities that make up daily life for years before it became a museum. I think that one of my challenges as a Curator is to give our visitors the sense that they are seeing a home with beautiful but ultimately functional objects in it, not a showplace for things that were never used. But I’m still not letting anyone lay on the bed, so don’t ask. One of the debates that circulates in the museum and archives field is about accessibility – how do we allow the public to learn from our collections while still appropriately protecting our objects and documents? This question is especially pertinent at the moment, as a so-called Presidential historian named Barry Landau and his “research assistant” Jason Savedoff have been charged with stealing documents from a number of historical societies and archives, including the Maryland Historical Society. The Baltimore Sun has been doing an excellent job covering the story, and the latest article can be found here. What do you think: is our responsibility to ensure that people experience and learn from historical objects, or to protect our collections at the expense of accessibility? I’m a little tired today, and it’s made me a bit envious of Queen Charlotte’s mode of transportation. Why walk when you can be carried? Apparently the Queen had four strong men on her staff just to cart her around. This particular sedan chair was made for the Queen in 1763 by Samuel Vaughan and is richly covered in red morocco leather and gilt ornamentation. It is still in the Royal Collection in England, and you can read more about it here. Sedan chairs were an efficicient mode of transportation in 18th-century cities. They could traverse narrow streets much easier than carriages, and allowed riders to get to their destination without ever having to step outside, as they could fit through doorways. While sedan chairs had a long history in Asia and Europe, they were used in colonial America as well. Supposedly when Benjamin Franklin was in Philadelphia he used a sedan chair to get to Independence Hall. I even found a reference to sedan chairs in Annapolis; in “Side-lights on Maryland History” by Hester Dorsey Richardson (available on Google books), the author asserts that “the streets were not such as to tempt the high bred dames of the period to spoil their French slippers when taking the air, and hence we find in Colonial Maryland the Sedan chair a not uncommon luxury of the Court Circle there.” I’d love to find a primary reference from 18th century Annapolis that mentions traveling by sedan chair – has anyone ever seen one? It’s been a busy week at the Hammond-Harwood House, as we’ve been editing, printing, and folding our biannual newsletter. The e-mail version should be going out tomorrow, so if you’re not already on our mailing list go to our homepage (http://hammondharwoodhouse.org/) to subscribe. Since I haven’t had time to generate blog content, I thought I’d point you to another of my favorite blogs. Two Nerdy History Girls is written by Loretta Chase and Susan Holloway Scott, two authors of historical fiction that use their blog to share interesting tidbits they turn up while researching their books. I loved their post today about tight lacing, which just reinforces the fact that only a small minority of 18th-century women used their stays to try to reduce their waist size. The dining room at the Hammond-Harwood House is usually set for a fine meal, as if Matthias Hammond were entertaining guests. One of the things he might serve them is punch, out of this Chinese export porcelain bowl. This bowl has a storied past; it supposedly came to America on the ship Peggy Stewart, which the outraged citizens of Annapolis insist be burned because its owner imported tea during an embargo. The burning of the Peggy Stewart will receive its own blog post someday, when I’m better able to unravel Matthias Hammond’s involvement in the affair. 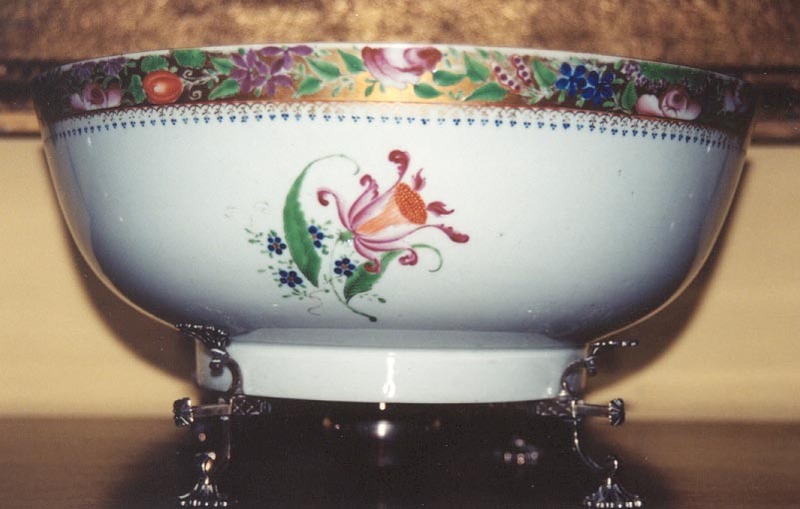 The story of the punch bowl is told in the 1887 book “The Ancient City: A History of Annapolis, in Maryland, 1649-1887” by Elihu S. Riley, on pages 309-310. It’s Riley who dubbed it “A Notable Bowl,” a fitting appellation. Click here to view the volume on Google Books.